A Vegetable and Herb Planter Pretty Enough for the Front Door! Now here are some great tips for mixing up edibles and ornamental plants to make a gorgeous planter that you don’t just harvest, but that you can display with pride! Please welcome our friends over at Brolly to share with us how to plant and protect these beauties. They really know how to keep container gardens beautiful. 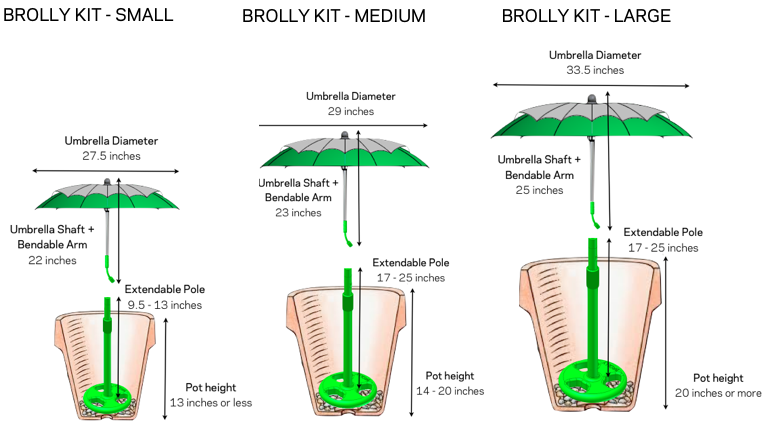 To win your very own large Brolly, read on! Entry instructions are at the end of the project. Why go with just flowers or foliage in your container? Mix them up with edible herbs and vegetables that can be just as striking. Savor the color, texture, and taste of a magnificent tapestry and make your patio stand out from the pack. Or place it at the front door to welcome guests in style. The first step is to choose the right mix of plants. Choose your selections so they thrive in the same type of soil, drainage, and level of sun/shade. Go shopping at your garden center and read the tags to look for similar requirements in the plants you love. 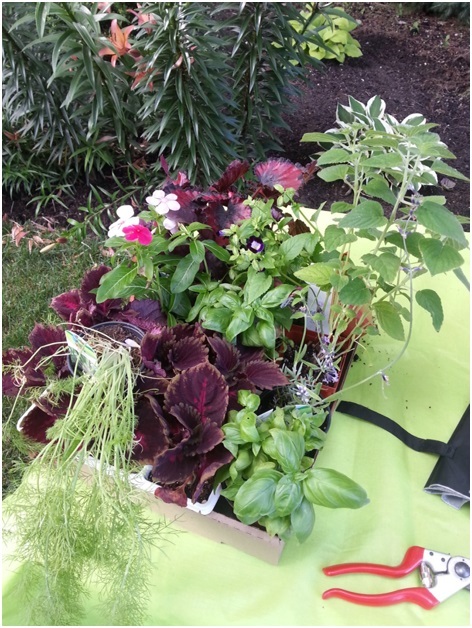 Put them all together in your cart to see if you have the right mix of edible and ornamental. Next pick a great pot that has proper drainage. A good rule of thumb is a 1 inch hole every 6 inches. 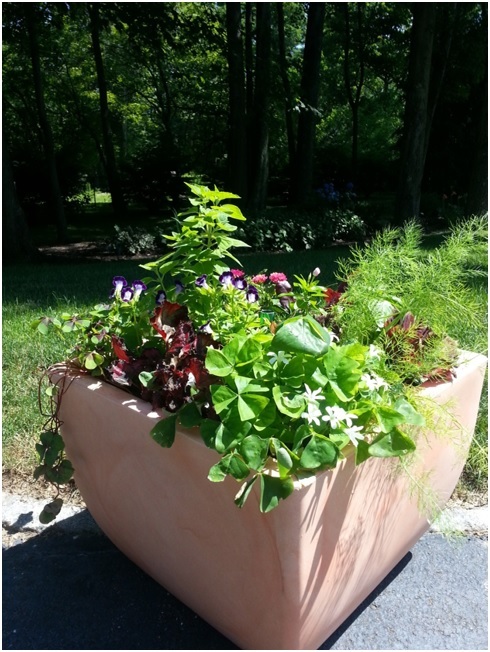 Remember that metal containers tend to become very hot in the summer and will affect delicate root systems, terracotta pots are pourus and need more watering, and plastic pots retain the most moisture. Self watering containers have a reservoir that will lessen your need to water, which is a great thing during busy and hot summer days. 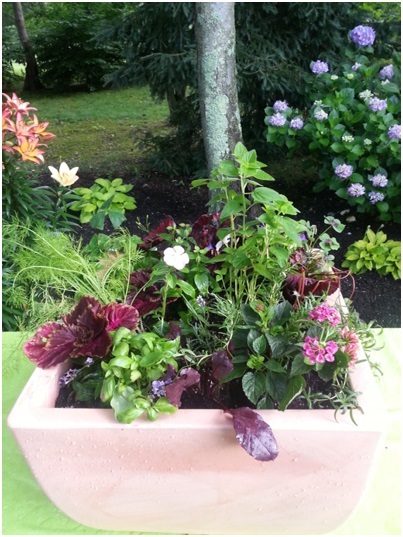 To plant your pot, choose a good quality container soil with added compost or organic fertilizer. We recommend one third garden/regular soil, one third lightweight soil (potting mix), and one third peat moss or commercial soil conditioner that helps to prevent soil compaction inside a confined space. Your pot will be showy and full of life, and this will lead to a need for regular fertilization. And don’t forget watering! If you can also add a drip irrigation line, watering will be a snap. When putting all of this effort into a showy garden, it’s not much fun to have to drag it to a sheltered spot in the event that the weather has turned. Heavy rains or blistering sun can stress out the planter and ruin all of your hard work. Our secret tool is a Brolly. An ingenious container protector that you prepare for when you plant. 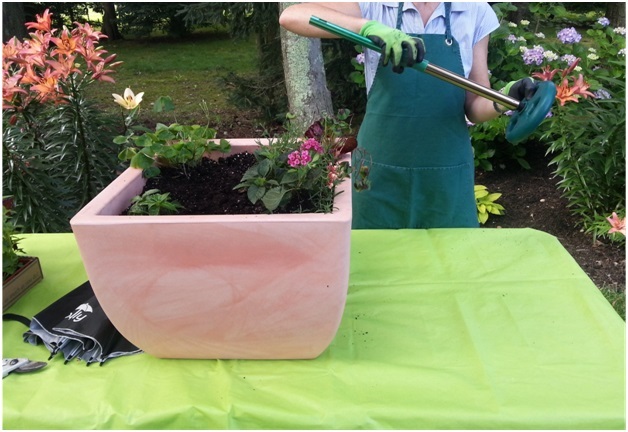 Simply add the base of the brolly to the bottom of the pot, fill with soil, and plant it up. Then come rain, sleet, wind, or scorching sun, you are ready to pop on the Brolly top and protect your pot! This assembly that can be used to temporarily shield the plants can also be used to protect your plants in their early stages or before the risk of frost has passed. Now go set that planter out at your front door, and know that it will look stunning for many more months to come, no matter what mother nature throws at you. Beautiful aromas, sensational senses and a glorious summer to all! Brolly has been kind enough to offer a discount to all Garden Therapy readers from August 9-23, 2013. Just enter the code “GARDENTHERAPY” when you check out and your order will be 35% off! Want to win a Brolly? Sure you do! Residents from Canada and the US can win a large Brolly, by simply leaving a comment on this post before August 9, 2013. This contest is now closed. Congrats to Claire who won a large Brolly! The preceding guest post was shared by our friends over at Brolly. 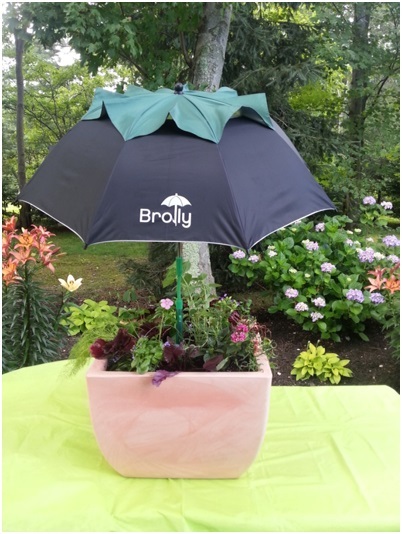 Brolly was developed due to many years of frustration and disappointment with annual container plantings, caused by intensive winds, scorching sun and lashing rains. A group of professional gardeners and engineers came together and designed a practical, REMOVABLE system that temporarily SHIELDS and PROTECTS annual container plantings when harsh and damaging conditions prevail. The protective canopy can be installed in an upright position, or can be pitched (by means of the bendable arm), to any angle or direction required, delivering thorough protection and shielding for the plants. This INNOVATIVE and EFFECTIVE product will enable your plants to flourish, ensuring beautiful, lush containers throughout the entire growing season. Excellent idea. Something to definitely work on next spring!! I truly believe that everyone should grow their own herbs…not only are they gorgeous to look at and smell, but it’s way more cost effective than buying them at the store!!! <3 Thanks!